This archive holds all posts form November 27, 2014. The late Hérnan Vera and I have written about the importance of the breakdown of empathy as part of the creation of racist systems, including discrimination and its racial framing. 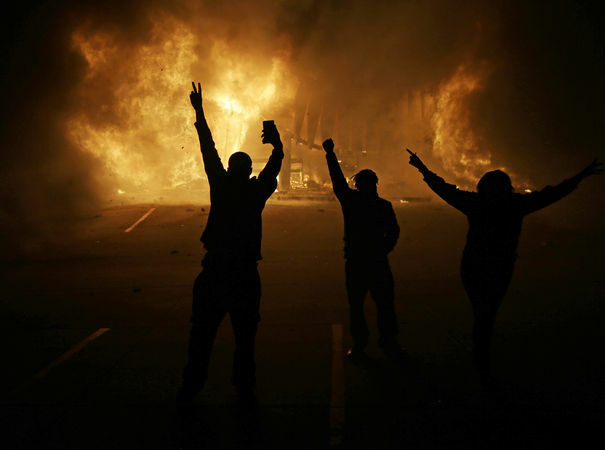 We have coined the term “social alexithymia” for the inability of a majority of whites to relate to the commonplace, past and present, police brutality and other racial oppression faced by African Americans and other Americans of color. recruited white and black Italian volunteers and asked them to watch videos of a stranger’s hand being poked. When people watch such scenes, it’s actually possible to measure their brain’s empathic tendencies. By simulating how the prick would feel, the brain activates the neurons of the observer’s hand in roughly the same place. These neurons become less excitable in the future. By checking their sensitivity, Avenanti could measure the effect that the video had on his recruits …. most interestingly of all, he found that the recruits (both white and black) only responded empathetically when they saw hands that were the same skin tone as their own. If the hands belonged to a different ethnic group, the volunteers were unmoved by the pain they saw. Avenanti actually thinks that empathy is the default state, which only later gets disrupted by racial biases. He repeated his experiment using brightly coloured violet hands, which clearly didn’t belong to any known ethnic group. Despite the hands’ weird hues, when they were poked with needles, the recruits all showed a strong empathic response, reacting as they would to hands of their own skin tone. … strong evidence that the lack of empathy from the first experiment stems not from mere novelty, but from racial biases. which looks for hidden biases by measuring how easily people make positive or negative connections between different ethnic groups. For example, white Italians are typically quicker to associate positive words with the term “Italian” and negative ones with the term “African”. And the faster they make those connections, the greater the differences in their responses to the stabbed black and white hands. … All in all, Avenanti says when we see pain befall a person from our own racial group, it immediately triggers resonant activity in our own nervous system. When we see the same event happening to someone of a different race, these simulations are weaker and take longer to form. These anti-empathetic reactions are most serious for those who have the greatest power to oppress others, to cause great, routine, and recurring pain in racialized others, which is typically whites in Europe and the United States. In the U.S. case, whites’ recurring discriminatory actions targeting Americans of color — including thousands of police brutality and other malpractice incidents over the last decade — require a breakdown of normal human empathy. Most social theorists have missed the importance of the fact that all human life begins in empathetic networks–the dyad of mother and child. Usually central to these first networks is basic human empathy, a desire and ability to understand the feelings of others. Without empathy on the part of mothers and other relatives, no child would survive. As it develops, racial oppression severely distorts human relationships and desensitizes the minds of those oppressing others. 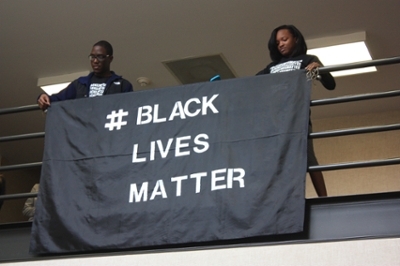 Oppression requires in oppressors a lack of recognition of the full humanity of racialized others. Psychiatrists use the term alexithymia to describe people unable to understand the emotions of, and empathize with, others. Hérnan and I have suggested going beyond this individualistic interpretation to a concept of social alexithymia. Essential to being an oppressor is a significantly reduced ability to understand or relate to the emotions, such as recurring pain, of those targeted by oppression. Social alexithymia thus seems essential to the creation and maintenance of a racist society. What needs to be explained most is not the reality of human empathy and solidarity—the problem often stated by western philosophers–but rather how this empathy for others gets destroyed and how human beings develop anti-empathetic inclinations essential to racial oppression. 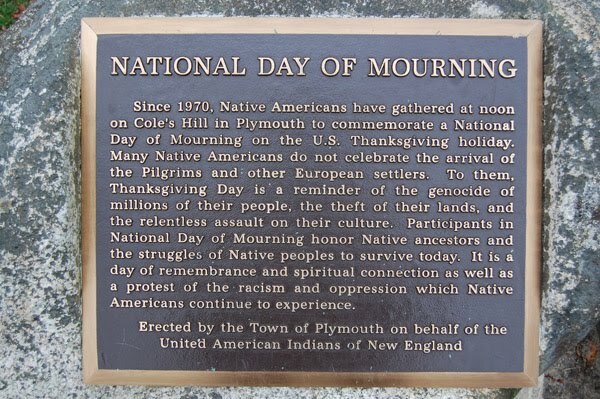 Today, in Plymouth, Massachusetts, Native Americans will gather to mark a “National Day of Mourning,” as they have for more than 40 years. The protests began in 1970 by Wamsutta Frank James and are carried on by his son, Moonaum James. 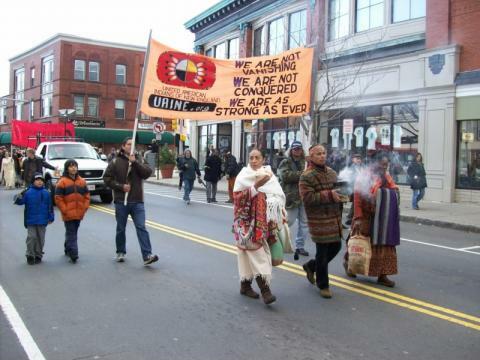 In an interview with the Boston Globe, James said demonstrators are not against Thanksgiving, but rather want to “correct the history” of the holiday that suggests that the Pilgrims and Native Americans coexisted peacefully. “We’re not there to condemn, and not there to do anything other than point out some truths,” he said. It’s expected that more than 100 people will gather today at noon and then continue with rallies at Plymouth Rock and at the site of the Metacomet (King Philip) historical marker to remember the Native Americans who died after the Europeans arrived in the 1600s and to highlight the struggles some Native Americans face today.